When it comes to premium cuts of meat, two steaks stand unique among others for many reasons. These are Ribeye and New York Steak. Almost every steak house stocks them daily. But does it mean that since both are premium steaks, you can choose any of them because they are similar? No, there is a difference worth knowing that many people do not know about these steaks. Yes, both steaks when prepared well result in tasty and flavorful meals but a keen person can draw a clear difference between them. Although the choice of any of them is a matter of personal preference, you ought to know how each of them is unique from the other. This article helps you to answer such questions. It explains the difference between Ribeye and NY steaks, getting a better cut for your steak, and finally gives a verdict of which one between these two premium steaks is the best. What’s the Difference between Ribeye Steak and New York Strip? Which One is More Tender; Rib Eye or New York Steak? Is New York Strip Healthier than Rib Eye? Which One is a Better Cut for Your Steak? 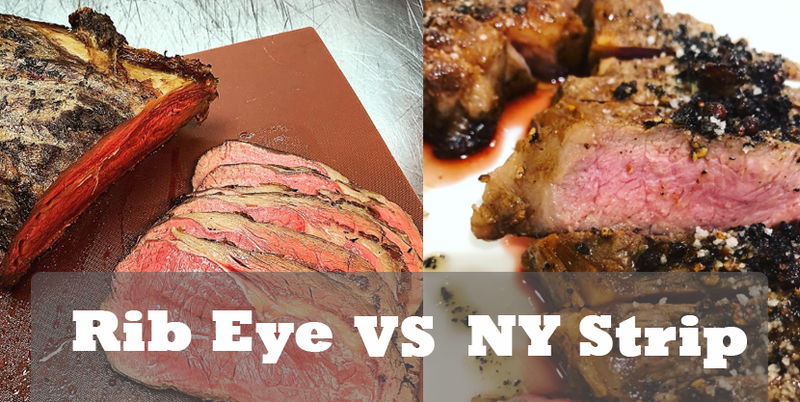 Determining a better cut of meat between Ribeye and NY steaks requires an in-depth analysis of a couple of things. Although people usually choose between these two as a matter of personal preference, there are vital things worth knowing. Consumers of New York steak describe it as flavorful, tender and juicy. It is, indeed, a nice type, and it has been given a couple of names. Some people call it Strip steaks, Kansas City steaks, strip loin, top loin steak, and a couple of other names. It is very popular in the US, Canada, and Australia. Although all these are its names, the commonly used name for this meat type is New York Strip. NY strip is harvested from the area between the short loin and the rib. In simple terms, it comes from the cow’s loin area. It consists of a muscle that keeps the steak tender. 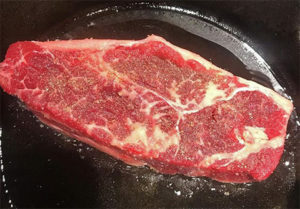 If you love it and would like to buy something that will last a couple of days, get NY Strip that is a bit thick preferably one inch or more, so it doesn’t dry out. Also, it becomes a little bit easy to handle when boiling or grilling since it is soft. Just like the NY strip, Rib Eye has a couple of other names used to refer to it in different countries. One common name that is often used is Scotch Fillet. Rib Eye Aside from that, is flavourful, and you can choose one with bone or without bones. 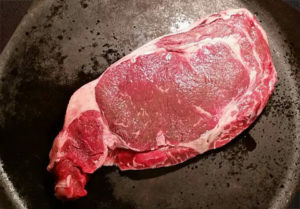 Compared to other types, Rib Eye is more popular especially in barbecues, and it is always great when it is eaten rare or in any other way the consumers love it. Regarding where it is harvested, Rib Eye is extracted from the rib portion just as the name suggests. Specifically, it comes from behind the chuck between movement areas and major joints. As a result, rib eye tends to be richer in fat marble; hence it is always juicy as well as tender. Rib eye can remain in a good condition for a few days provided it is prepared nicely. It may not, however, be the best for people who like less fat. While both Rib Eye and New York Steak are premium cuts that come from the rib and short loin area, the fact is that there is a difference worth noting. Regarding tenderness, Rib Eye is tenderer compared to the NY strip. Moreover, it has more fat marbling meaning that there is also a difference between these two steaks when it comes to flavor. Now you know. If you like fatter steak that is also tenderer is Rib Eye. Flavour is also great and is one of the factors that make Rib Eye popular among other types. Health factor is also very vital when comparing these two premium cuts. New York Strip is healthier than Rib Eye for a couple of reasons. For instance, the strip has fewer saturated fats and calories compared to Rib Eye. Furthermore, it delivers more protein meaning it scores better than Rib Eye when it comes to nutritional value. The difference in fat content also makes NY strip healthier than Rib Eye since it has less fat. In fact, if you want meat and not too much fat, then your choice should be the NY strip. With so many steaks to choose from or even given a chance to pick one between NY Strip and Rib Eye, making a decision can at times be tough. Also, healthy living requires that you be careful with what you buy. 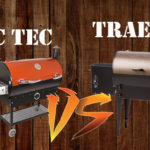 Furthermore, your cooking style plays a role when it comes to choosing one between these two steaks and others out there in the market. 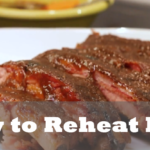 Do you want to broil, grill or pan-fry your cut? Also, what kind of flavor would you like to enjoy? Once you have answers to these questions, picking one won’t be a hassle at all. Once again, remember that both the New York Strip and Rib Eye are premium steaks. They are among the top five most popular and ordered steaks in leading steak houses. There is, however, a difference between them as already explained that should help you when narrowing down to one. We cannot just say that one is better than the other one without giving the details. So if you want something tenderer, go for Rib Eye. On the other hand, if you prefer something healthier and with less fat, then New York Strip stands better than Rib Eye. Also, it is very vital when making your choice to look at other aspects such as the thickness of the steak. Do you want a thin or thick steak? And is there any difference between a thin and thick one when it comes to preparation? Well, thinner steaks cook well, but there is also another side of them that might not be too good for you. They are a bit difficult to master, and you can mess up with them if you are careless. On the other hand, thick cuts preferably more than an inch thick as already hinted are great to grill or cook. Although they can take a little bit longer, rest assured that they won’t be overcooked. In conclusion, Rib Eye and New York Strip are no doubt tremendous and drawing a line that differentiates them is not an easy task. However, from the information provided about them, choosing one won’t be too difficult again for you. Although the choice you make is a matter of personal preference, the differences specifically in health and tenderness are the most important things you should have in mind when choosing. Always keep them in mind, and you will get a perfect steak in the market. 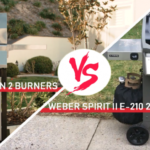 ← Napoleon vs Weber – Which One Produce Better Gas Grill? 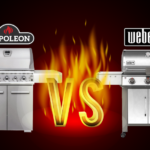 Napoleon vs Weber – Which One Produce Better Gas Grill? Copyright © 2019 Bulldog Barbecue & Burger.